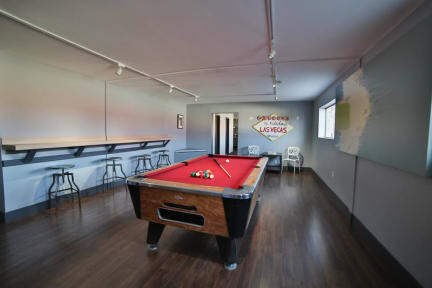 Las Vegas Hostel i Las Vegas, USA : Boka nu! I stayed at this hostel for 4 out of 6 planned nights. The staff was SUPER nice and helpful in all ways possible! Though, as a solo female traveler I didn't feel safe. The location is a very bad neighborhood, I was scared to go out after dark. Some parts of the facility has rodents, I had mice in my room but got checked into another immediately after I reported it. They refunded me for leaving early. The hostel itself was awesome for the very cheap prize. Would stay again but not alone! Staff we’re very rude and no atmosphere at all. No ones at the pool area. And if you’re a girl book the female dorm. It’s not like traveling in Asia/Australia where people wanna meet and hang out. There was always dirty dishes in the kitchen as well as food people just left out. When I talked to the reception the were very dismissive.